When to Harvest Okra | Grow This! Here you will find a guide for when to harvest okra for each region of the United States. Okra takes about two months after planting to mature. Pods are at their best when still young and tender. They’ll be 2-4 inches long and can develop fast once the weather gets hot. Harvest every day if necessary; okra left on the vine too long tastes tough and stringy. Use shears for easy harvest and keep a small bit of stem attached to each pod when you clip them off. Okra does not typically grow well in Alaska. Okra is typically ready to harvest from mid August to mid September in the Central/Midwest. However, you may see early harvest in July and as late as October. Harvest okra from June-November in the Gulf Coast. Harvest okra year round in Hawaii. Peak harvest season should be May-September. In the Mid-Atlantic, harvest okra from July-September. While okra is not likely to thrive in most parts of New England, you may see some harvestable pods in August. Okra is not recommended to be grown or harvested in the North Central and Rockies region. Okra does not typically grow well in the Pacific Northwest. In the hottest parts of this region, you may see some mature pods in August. Okra may be harvested from June-October in the warmest parts of the Southern Interior. In the cooler areas, harvest may be limited from June-September. March-July is the best harvest period for okra in the hotter parts of the Southwest. In the cooler pockets, harvest okra only in July and August. Okra harvest time may vary by a couple weeks from year to year. As climate patterns shift, so do harvest periods. Harvest periods can also vary within each region as microclimates can effect the time they take to mature. Poor growing conditions can slow growth and delay harvest. 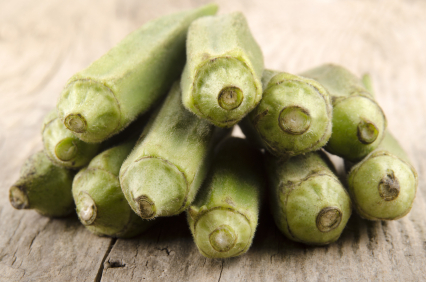 Okra can cause many people’s skin to itch. Use gloves during harvest if you have a reaction. Be sure to remove all pods that have passed their ideal size and grown too large. If left on the vine, they will slow the growth of more harvestable pods. Harvest diligently in hot weather to get the most out of your okra plants. The more you harvest, the more pods will be produced. Do you have questions or tips on when to harvest okra in your region? Let us know in the comments section below.